In celebration of Jolly Breakfast Day, we are giving away free Bacon, Egg & Cheese Sandwiches in all Jollibee Breakfast stores in Metro Manila on March 11, 2019. 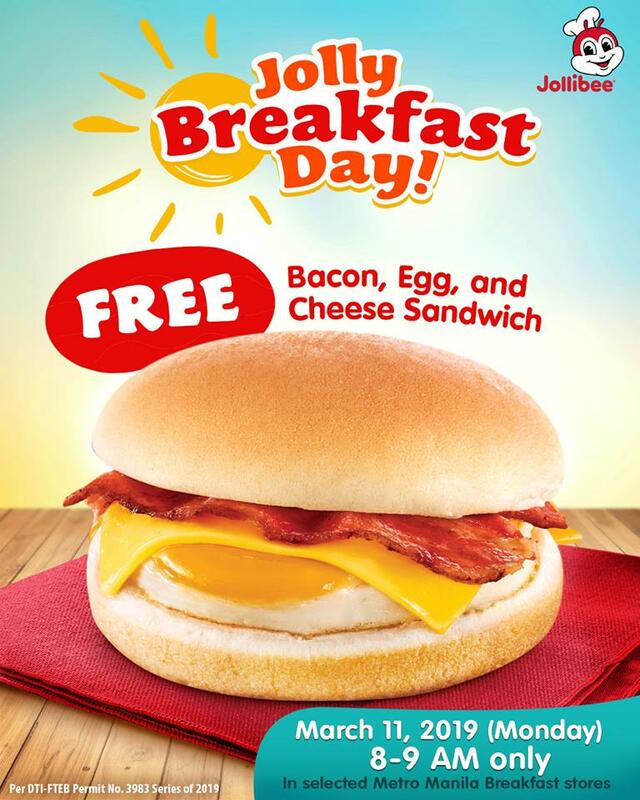 · Head over to any of the participating Metro Manila Jollibee Breakfast stores on March 11, 2019, from 8-9 AM and get a chance to get a claiming stub for a free Bacon, Egg & Cheese Sandwich. · Claiming stubs will be distributed from 8-9 AM at a designated area in the store. Only one claiming stub will be given per person. · The claiming stub is applicable to Bacon, Egg & Cheese Sandwich only. · Present and surrender the claiming stub to the cashier at the front counter to claim one (1) FREE Bacon, Egg & Cheese Sandwich. · Valid for dine-in and take-out only. · The stubs and free Bacon, Egg & Cheese Sandwich will be given on March 11, 2019, from 8-9 AM. · The stubs are redeemable on March 11, 2019, from 8-9 AM and can extend until 10 AM only. · Cannot be used in conjunction with other promos.